This is an interesting idea, but this would potentially involve some considerable complexity to implement, as detecting the state (passengers unable to board due to overcrowding) and assigning this to a specific convoy is not straightforward, especially as to the question of until when that status should last. Hiw long? Probably same as normal overcrowding indication. The normal overcrowding indication does not have the same issue with duration: it is active when the any is overcrowded and inactive when no vehicle is overcrowded. The "full" indication may be more straightforward, although it would subtly change the meaning of the current overcrowding indicator. I should be interested in people's views as to whether this changed indication would be clearer and preferable or whether there is any difficulty with this. I think having overcrowded as an indication that the convoy is at least full (not including overcrowded capacity) is probably pretty good, as long as this indication is disabled if the convoy is set to wait for 100% loading at any point in its schedule (in which case it is deliberately being run at full or over-capacity). This latter exception concerns me a little: I imagine this being very confusing for players to understand, as it is very subtle. I wonder whether there is a way to avoid these problems while addressing the issue that this exception was intended to address? Perhaps showing overcrowding only for passengers (and maybe mail)? 100% load is usually done only for freight. That is one possibility: but I wonder how clear that this distinction would be to the user? I think that this becomes complicated is that the current capacity may be mixed with non-passenger cargo in same convoy. Even if the standing space of it is full and lowest level passengers can not ride, for example, the first class may have vacant seats. In that case some vehicle overcrowded but the capacity is not 100%. Yes, that is complex indeed. One solution might be to show purple if any type of goods/passengers in the convoy are full, but that might make mixed trains appear to be overcrowded when they are not. The ideas is to separate the standing room capacity from capacity indicator like this. I think that it is desirable to show overcrowded if any cargo is overcrowded. Typically combined pax+mail trains where there is a lot of space for mail, but not enough for passengers. For classes, it should show overcrowded if the lowest class accommodation is full. I think that there is a limit to the way to tell the player by changing the text color. For example, it can not tell at the same time that it is deficit and that it has vehicles that can be upgraded and that it has overcrowded vehicle. So I think that it can announce overcrowded by displaying this icon which I made for the station information somewhere. For example, if two are displayed, it means that passengers can not ride it any more. or creates new icon with two purple people. Ive been working in the convoy info window and I found that it can easily become many messages that one wants to display in the window. I believe that there are a bunch of disabled messages already in the window but which is disabled due to information clutter. A red version of the icon shows if the convoy is max overcrowded. You could even expand further and draw icon with only two people or one person to demonstrate that certain capacities within the convoy (for instance a particular class) is running empty. One more idea related to this. convoy/line windows shows green bar about how much capacity is used. But it takes into account total capacity of all cargo types in convoy/line. It is quite useless for mixed pax/mail convoys, with capacity e.g. 24 pax + 200 mail. (one of the small ships). So if this could show separate bars for each cargo type (pax, mail, bulk, piece, long, oil, ...), then it would be much more useful. Spliting further into standard (sitting), and overcrowded (standing) would be a nice bonus. Thank you for all of your thoughts. 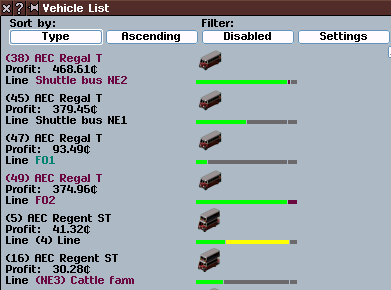 I do like the idea of an overcrowding (purple/red) icon in the convoy information window - but we still need the text colour in the line management window. If this is to be changed, it may be better to have it go to purple if any class of passengers is overcrowded. What I proposed was a simple alert function showing overcrowding. It is a display to notify the player that overcrowding is degrading convoys comfort and passengers may be left behind. Like the image below for example. Perhaps it is relatively easy to implement. It does not conflict with the status bar representing the wait state. The standing capacity is on the upper right of the bar. It is like these examples that I think this is complicated. It is also possible that certain classes are full. So if this could show separate bars for each cargo type (pax, mail, bulk, piece, long, oil, ...), then it would be much more useful. Note that the capacity bar is also used in vehicle list and line manager. I do not think it appropriate to represent it in green. The train may have left passengers who could not sit at the station. I suggest orange or something. And F and G are the same for passengers, but G is not 100% loaded. Passengers are moving by different mechanisms such as mail and goods. For example, they may cancel a trip if they are kept waiting for a long time, a decline in comfort due to standing or overcrowding affects the allowable journey time. So I think it is better to use overcrowding icons exclusively for passengers. So I think it should be split by classes. Honestly, I never really liked that icons where shown in the view window, since I tend to mis them there. Granted, this particular view window is moving (whenever the convoy is moving) making it easier to spot that there is an icon present, but having icons in the view window in general is another subject for another thread. In this particular case, having a "negative" icon in the view window that encourugates the player to perform an action might be confusing, since all the other "view window icons" as far as I know delivers "positive" messages (in the factory window) that the player would not be harmed to mis out on. For better visibility you could put the icon somewhere close to the loading bar, for instance right in front of it where there tends to be alot of space. 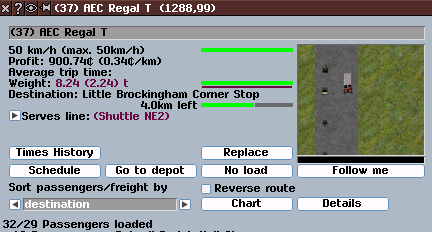 It would make it easier to spot at a glance and the player would understand that the icon is connected with loading the convoy. Also, the overcrowded capacity is not tied to a particular class, but rather individual vehicles. I like the loading bars if I understand correctly that it means one loading bar for passengers with its additional overcrowded loading bar, and then one loadingbar for all other good combined. I suppose that if a particular class is full or overcrowded the overcrowded bar starts to fill as well as the overcrowded icon appears. It could be cool if you made the overcrowded bar proportional in size to the ratio between normal seats and overcrowded capacity. That would mean that if a convoy has 100 seats and an overcrowded capacity of 100, the bars would be equal in size. But maybe that would just be confusing. About the case of a full good category, perhaps some good icon displays next to the loading bar? but having icons in the view window in general is another subject for another thread. Another forum, perhaps, if this is also present in Standard. In that case, whatever comments you'd make here would presumably apply also to Standard. I thought that the idea of dividing the bar vertically would cause problems with the display of the minimum load setting. When dividing it, the yellow loading gauge makes no sense. This is a rush job, but I tried separating only the overcrowded gauges into the same row. This is easy to understand, so I do not think there is any need for an icon in particular. In this case it is not necessary to make the letters of weight purple, right? If the convoy does not have passenger's standing capacity it is the same as before. It is separated before the overcrowding gauge. I liked the idea with two different loading bars, but you are right that it doesn't go well with the "wait for load" setting. The easiest way to keep the dual loading bars would be to abolish the yellow bar when it is waiting for loading. After all, the feature with the yellow loading bar was implemented in standard long before the status text of the convoys (and hence also the loading text) so the information would not be lost, only visible another place. As to the icons and colors, I think it should be kept as simple as possible. For instance, although the different icons perhaps show more precisely what they mean, they are small and might be hard to differentiate. Especially the two purple ones, where one has three people and the other has four people. When a class is full as well as the overcrowding capacity is full, meaning that no people for the particular class can board the convoy. When one or more cargo categories are full. Same here, I don't think it is necessary to have different icons, although a new good icon. Perhaps a dedicated mail version, but not necessarily. I don't think it is necessary to have the loading bar change color when it is full. It is rather obvious when it is full, and it might add confusion as to what it means when the color changes. I uploaded patch on my github branch which adding overcrowding bar. This is a simple implementation with minimal alteration of functionality and layout. - Simply separate the bar into overcrowding gauges and other gauges. This ratio corresponds to the capacity ratio. For example, in the case of a seat 900 with a standing 100, the length of the bar is 9: 1. - The weight value of convoy information window no longer turns purple even in overcrowding. Strictly speaking, overcrowding and weight are not directly related. 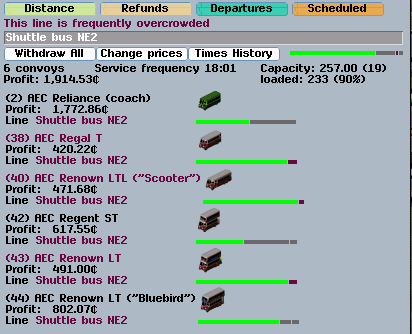 - Added display of line's total standing capacity in the line management window. The easiest way to keep the dual loading bars would be to abolish the yellow bar when it is waiting for loading. The text of waiting for loading is displayed only in convoy information window. In other windows, players will not be able to know that the convoy is waiting for loading. I think that if the bar is doing enough work I think that duplicate icons are not needed in the same window. However the current issue is that player do not know how much passenger occupies the green contents of the capacity bar. Therefore, currently player can not judge whether the seat is full or not from the gauge. There is a possibility that only the capacity of mail is vacant capacity. I don't think it is necessary to have the loading bar change color when it is full. Since there was a problem with the timing at which colors are reflected, I did not adopt this function. In the example above, I only showed passenger and mail, but actually there are goods too. Separating passengers by class makes it even more complicated but I do not think that they do not need those information. I think the separated bar is the work that the bottom area of convoy information or convoy detail should do. Passenger has a problem of class, and goods also has problems of category and kind (and goods color) so it is complicated. Thank you very much for your work and feedback on this respectively, and my apologies for not having had time to respond until now. This does look very interesting. I do like the green/purple divided loading bar: that works well, I think. I agree that the yellow loading bar should be retained for waiting for full load, as this is clear and visually useful. Can I check, as I am not entirely clear, which of the GUI features discussed at various points in the thread have made it into the latest version of this branch, and, Ranran, do you believe that this is ready for final testing and integration yet? Thank you again for your work on this. Spliting further into standard (sitting), and overcrowded (standing) would be a nice bonus. It could be cool if you made the overcrowded bar proportional in size to the ratio between normal seats and overcrowded capacity. I liked the idea with two different loading bars, but you are right that it doesn't go well with the "wait for load" setting. As I mentioned before it is a simple implementation with minimal alteration of functionality and layout for improve overcrowding indication, and focus on it. The separation of classes and categories is very complicated and I think that it is another topic. Ranran, do you believe that this is ready for final testing and integration yet? Thank you for that summary. Looking at this in testing, a query about how this works, if I may. I am looking at a train which carries both mail and passengers. The mail has a capacity of 210 and the passengers a capacity of 310 in a single class (low). The mail section is empty, and the passenger section is overcrowded: there are 358 passengers aboard. What I see on the graph in both the line management window and the convoy information window is a green bar filling about 1/3rd of the horizontal graph, then a grey section filling about another third, and the final third has about a quarter purple and the rest grey. I am not entirely sure that I follow what this is intended to represent - are the grey sections referring to the mail capacity? What about the grey section to the right of the small purple section? I guess that is probably represented as in the table below. The whole bar is 520 + ”?? ?” (total standing capacity). Is this table answered to your question? If convoy is crowded but still have standing(overcrowded) capacity, the right side of the purple bar will be gray. If that convoy has 520 overcrowded capacity, the purple bar will extend from the center to the right. Thank you for that explanation: that is helpful. It is probably not wise to merge passenger, mail and goods capacity like this, however, as, when we add the overcrowding indicator, we get a very confusing graph: it looks as though there is overcrowding despite there being spare capacity, which makes no sense. Indeed, because of the way in which mail units are counted, a single mail carriage can have as much capacity (in terms of number of units) as a whole train of passenger carriages, which significantly distorts the numbers. We probably need to re-think this aspect before the overcrowding graph can be meaningful without being confusing. 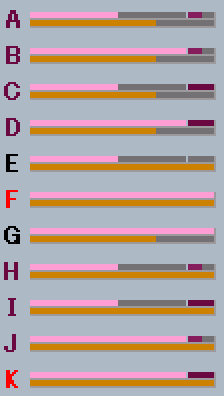 In fact, however, complicated circumstances like the one shown below occurred, and in the present situation the character color change indicating overcrowding is done when the purple bar is growing situation. it looks as though there is overcrowding despite there being spare capacity, which makes no sense. If the lower class is full, those who can not ride the upper class have to ride with standing even if the higher class has vacant seats. The fact that there is a standing person means that some of the classes is full. And if the overcrowding capacity is full, there is a possibility to leave passengers of lower class at the station. I think that the big problem to solve this issue is the minimum load setting. This function is not very useful for convoys that originally contain multiple categories or class (especially when setting to other than 100%). Since there is not enough space in the vehicle list and line management window, I think that the bottom area of convoy information or convoy detail should display the detail information. Separate the three categories while keeping horizontal one row. Three categories are displayed left justified, but overcrowded is separated. Passenger and mail will display the color specified by pakset. This is the same color as the waiting display bar at the station. I temporarily use a color close to the ware icon (dark brown). Goods have their own colors, I do not know if it is better to apply the color of goods. I think adopting it becomes complicated and may make it hard to see and such things are useful for display of each vehicle in the convoy detail window. I think this will fit in less space in the vehicle list and line management window. 1) It can not recognize which category the free space is. But I suppose it is impossible to achieve it at the same time unless we change the minimum loading system. 2) Mail occupies much of the bar, goods tend to occupy a small part of the bar. Other possibilities: Since goods are different in weight, it is difficult to judge by weight. And it does not have parameters like volume. Thank you for your thoughts on this. I recognise that this gives rise to difficult and complex issues. Can I clarify one or two things about the most recent post: do I understand that the horizontal bars represent, in descending order, the loading of mail, passengers and goods? Further, does the purple at the right hand side still represent overcrowding? Does the yellow represent the wait for load proportion; and do the pink/brown represent different categories of goods? I can see that there might be some real advantage to dividing it in this way, although I can also see that it might be harder to fit in the dialogue. I should be interested in people's views on these various possibilities and which would make more sense and be easier to use and understand both for new and experienced players. pink/brown represent different categories of goods? Pink represents passenger, orange represents mail, which is the same as waiting bar extending vertically on main window. I am going to make the brown a little brighter and it possible to set it with pakset. The state that the capacity of convoy gradually fills up is the next image. convoy has a capacity of passenger: 600, mail: 300, overcrowding: 100. And first set 50% wait for loading. I think that pink is difficult to see can be improved by adding a frame. I think this has gone far beyond my original idea - changing the color to overcrowded (violet) even if the vehicle is running full (for vehicles with no standing capacity), or showing some other color - maybe orange - similar to orange horizontal bar on overcrowded stops, if it is leaving passengers that cannot board on stops. I think best way would be multi line display for passengers, mail, and all goods categories that are present on given convoy/line (IMHO there would not be more than 4 most of the time). The graph for mail/goods can be as it is, as it does not involve overcrowding. For pasengers I think it can be the classic green/yellow/gray for sitting capacity (and wait for load), and (dark) grey/violet for standing capacity (scaled proportionally). Using pink/orange for pax/mail and other cargo colors is OK too. However I do not like combining everything in one line, it is quite confusing. I prefer multi line display.